Welcome to Alliance! We aim to bring you a hub of community chat, news, guides, and a comprehensive introduction to all that is "guilds". Alliance was a project that originated in OCTOBER 2012, and will continue to grow with time. Our staff do their best to make sure Alliance's resources are as accurate and up-to-date as possible. Feel free to explore the main links to the far left to see what we currently have to offer. Additionally, you are more than welcome at any of our boards to enjoy some friendly chatter. We almost always have a board running, so please check the GC and chat with us! Everyone is welcome! Alliance would not be here without the help of generous supporters and community members. We'd like to thank the following people for their dedication to the cause! Layout by Arie for Alliance. Support Alliance with a button or banner! Would you like to be affiliated with Alliance? Talk to Beth! Listing us in your directory? Let Beth know so she can link back to you! Counter started on October 13, 2012. There are many Neopians who are a part of a guild, hoping to create one, or are still looking for a place to call "home". In recent times, however, it would seem the guild boards are struggling in terms of the level of activity. 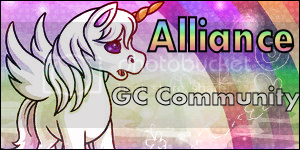 Alliance was an idea developed to bring the GC together as a community. Too long have we been individualistic groups, disconnected from each other. By providing a welcoming place to chat, get advice from others, and offer a comprehensive portal to many sites/pages involved with guilds, we hope to encourage higher activity levels on the guild boards. We welcome any one to chat with us - whether you are new to the GC or a well-known face. In addition to this, Alliance aims to gather a collection of guides and directories that can help those new to the guilding world to get the hang of it. Neopets offers such a large diversity in areas of interest, that it might just take this project to bring some of the spotlight back onto the guild boards. In order to do this, we want to ensure that Alliance provides a comprehensive guide and inside-look on what guilds are all about - and we can take our boards to other areas of the site to generate new interest in the guild chat. So, if you are new to neopets, or have just never taken a look at guilds before; you are in the right place. We want to show you the talent that can be found on the GC, and the fun you can have creating, or being a member of, a fantastic guild. If you have general questions or comments about the site, please send them to Bethany (not). We love to hear your ideas! Welcome to the Alliance Guild Site Directory - this page contains all resource sites and guides listed in alphabetical order. If you want to learn more about our resource directories, please check out our directory information. If you want to submit your site or resource to our directory, please read this page. It will also explain how we run the guide directory. When we have a more extensive directory, resources will also be listed by type. Welcome to the Alliance Guild Article Directory - this page contains a range of helpful guild related articles listed in alphabetical order. If you want to learn more about our resource directories, please check out our directory information. If you wish to submit an article to our directory, please read this page. It will also explain how we run the guides directory. Welcome to the Alliance Guild Discussion page - this page contains a selection of posts from the various topics hosted. Hopefully you will be able to browse through the different topics and get an idea what was said on the boards. Use the links below to quick jump to a specific topic. They are listed from oldest to newest. Most recent topic will be represented by a blue symbol. private vs. public, challenges faced by public guilds, challenges faced by private guilds, advertising strategies, ingredients of a successful guild, age requirements, application processes: fair or unfair?, when is it time to call it quits: revamps, restarts and closing down. How strict should leaders be with enforcing rules? Is it better to have a set of rules that are strictly followed, or just a few guidelines? What if a leader doesn't reprimand members? Is it worse to be in a guild that claims literacy but never enforces it - or to be in an advertised semi-lit guild? I /personally/ think that the rules, and how heavily they're enforced, should depend on the type of guild it is and the age range of the majority of the members. Example: A literate roleplaying guild should be strict on the rules, because you're making a /story/ together, so the members are /probably/ the older or more mature neopians. I think rules that are enforced cut down on the amount of drama that the guild is exposed to over the length of it's existence. Another aspect of this is how a guild leader handles rule breakers because that will affect the reaction said rule breaker has upon the enforcer. I handle drama like I handle it in my classroom. I stop the public scene immediately and handle it privately, whether that be through neomail or what have you. Don't have it publicly on the guild board where all members can see. The moment you have a scene is the moment multiple other possibilities can happen (more drama due to more fuel to the fire, offending other people, etc). I also recommend deleting any drama-related messaged and neomail said person immediately and use specific word choice to inform said rule breaker what they've done & how they can avoid it in the future. The moment they turn the guild you are taking your free time to run and causing extra, unnecessary stress for you and are being just outlandishly rude, unreasonable, and are clearly out of line, I say just block and be done with them. You tried, you took the high road, but at some point, "Expulsion," is needed. I get onto neopets to have fun and meet new, not meet some grammar police. If I wanted to talk to a grammar police, I'd go talk to my English teacher. Therefore, no, I don't think the literacy rules should be /THAT/ strict. I personally think that leaders should be strict on the rules that they have set in place. Leaders create a guild for other people to enjoy and take part in, and spend their time and effort to ensure they are running somewhere enjoyable. In order for leaders to do this - they have to genuinely enjoy being the leader of the guild. If they are too worried about enforcing the rules that they allow things to deviate from their original goal (i.e. a literate guild moving closer towards semi-lit), well, then one day they'll wake up and find that they no longer love the guild as they once did. So, though the members happiness is first and foremost on a leaders mind. I think that for a guild to be successful, the leaders happiness is paramount. In spirit of the silly season, and Alliances goal of building a community, I thought we could discuss inter-guild courtesy. What are some things that guilds (members and leaders) can do to build community ties in our GC? - Advertising another guild if the guildless person is seeking something that does not fit your guild. - Respecting the creative property of other guilds. How inspired is too inspired? Do you have other suggestions? How do you feel about the GC community today? - Any board not just specifically for advertising or finding a guild build community ties. - Sister guilds; forming friendships with guilds of a different theme to your guild so if you run across a guildless person seeking something you guild does not match, you can advertise your sister guild. - Respecting other guilds, including their intellectual property. Mailing leaders of guilds who have inspired you is a great way to avoid causing unnecessary rifts. Just write to the leader, ask nicely, and explain how you'd change the concept to maintain uniqueness. We want to get your opinion on the different literacy rules of guilds. These days there are a wide variety of classifications of literacy; none, semi-lit, loosely-lit, and literate. There even seems to be an increase in the term lit+. Which of these terms should be reserved only for RP guilds? Should any apply to none-RP guilds? Is there a point to semi-lit, or does this just class on none-literate? There seems to be an increase in the phrase "we are literate, but we allow smilies", at what point did the use of smilies become illiterate? Please, discuss any/all of these issues, or bring up your own topic (about guild literacy) to discuss. In my mind, semi-lit, is basically lit without a requirement of how much you have to post. Though some semi-lit guilds have a very small post requirement. Ah, that is a reasonably explanation of semi-lit. I wonder how wide spread that idea is - since I'd assumed semi-lit meant allowing the use of some common forms of chatspeak, and allowing for some lack of grammar (i.e. those that never capitalize). Yeah. I think every guid just defines their literacy differently. It would help people to better understand their literacy policy if they would say, post it on their ad board, or somehow make it more clear. So, you think there does not need to be a set term for each type of literacy and that they are more broad terms that the guild itself needs to spend more effort fleshing out for potential members? But, on the note of semi-lit guilds being stricter, just how strict can a semi-lit guild be before they are a literate guild? It's kind of hard to say. Each guild's literacy policy is different whether they are semi-lit or lit. So I mean, maybe instead of saying your semi-lit and lit, just have a page explaining the guilds own policy. I have never really seen a line between the two. That makes sense. I've actually been meaning to make a page about Coverts literacy policy ^-^; So, guild adverts could include a link to the guild web/portal, and the guild literacy policy. So, a guild with a literacy policy can just be considered a literate guild - and the variance is decided on by the leaders. I've always been under the impression that, "Literacy," fell more into the tolerance of grammar, punctuation, capitalization, and other common conventions as opposed to length or replies and such. I know that when I think of semi-lit, I assume they allow for people to not capitalize or use apostrophes. Though, and here is my opinion that is not meant to offend anyone, I personally do not see the point in the term semi-lit. There are very, very few people left on neopets that use chatspeak in the way that is always used as an example (sPe4kINg lyk d1s), and typically they fall into the category of trolls/ spammers. If you do not use capitalization and punctuation then you are not using the English language correctly and are not being literate. I feel like guilds only need to claim to be literate, or not use it as a term for their guild. Most guilds have a "no spam rule", and I don't see why over the top 1337-speak cannot just be included in that rule. So, ultimately, I see no need for the semi-lit term and see that as just not being literate. I feel like semi-lit has more of a negative connotation, so many guilds tend to stray away from it. Semi-literate for Calypso at least doesn't require capitalization and simple and common abbreviations. (ntmy, ty, yw) Though the members for the most part are literate, just gives them some leeway. None: No rules are set, basically. Semi-Lit: "We aren't too strict, but d0nt tlk lyk d1s!1" Basically, that. Vague literacy rules which suggests that anything goes, but clearly don't allow for extreme illegibility. Loosely-Lit: This appears to be pretty new. I understand it as basically a Semi-Lit guild with clearly defined literacy standards or a Lit guild with multiple clearly defined exceptions. Literate: Expects proper capitalization, punctuation, and very little chatspeak (may allow a lol here and there). Lit+: Also seems new, and also seems to be used mostly by RP guilds. I understand this as basically essay writing rules for guilds. I think you have given reasonably good descriptions. Though, I think that your description of semi-lit rather fits with my opinion that the term seems rather pointless. Since I'd consider extreme illegibility to go under 'spam'. I don't think I could handle having so many different new terms to try and define the exact same thing o_o; I'd consider loosely-lit to fall into literate or not depending on the extent of the rules/ exceptions. Lit+ I am fine with since it is typically reserved for RP guilds. In fact, I'm much happier seeing the terms to define literacy attached to a RP guild: loosely-lit, lit, and lit+ since they tend to relate more directly with writing talent /post length /RP styles. I kind of think Semi-Lit and Loosely-Lit as essentially the same thing, and I think Loosely-Lit was just created to try to avoid using that dreaded 'Semi-Lit' buzzword. Back when I used to make guilds in 08/09, there wasn't all of these names and you were either Semi or Full Lit. It is funny how words do get connotations - I would much prefer that loosely-lit replaces the idea of semi-lit. Since semi-lit seem to be a sort of "anything goes" and they might as well just not have themselves defined by literacy (like how guilds without age requirements don't list "no age requirements" or refer to themselves as 0+). While Loosely-lit implies there is a literacy policy but that it contains exceptions (i.e. two sentence minimum but common abbreviations allowed). Semi-literate is a term that means absolutely nothing. People have to use it, though, because otherwise people will grumble - "I don't want anything less than semi-literate!" essentially is meaningless, because it's not like guilds that are completely lacking in any sort of literacy policy regarding capitalisation, punctuation, full sentences, etc. would ever call themselves 'illiterate'. I guess that the way the guild community has developed, and the way humans naturally like to categorize things, has made it so guilds have to use such terms to cater to the guildless. Discussion Topic 4: Side accounts in guilds? After a recent question asked on the HC for our FAQ section of Alliance, I thought this was an interesting topic for discussion. Do you think that, within private guilds, there is a predominance of "no side accounts" rules? Why do you think that a guild might only accept main accounts? Is this goal actually achieved by having the "no side accounts" rule? Could this goal be more easily achieved through other means? Don't member sweeps and such take care of inactive members anyway? I find that it varies from guild to guild on the 'no side accounts' rule. There are quite a few people that have very active sides and would be a participating member in a guild with said side account. But there are those who get on there side accounts once a week or less and would be better of joining a guild that did not have set activeness requirements. While main accounts are generally more active and time/dedication have been spent on the account, the no side account rule is a bit redundant. Guilds that ask for no side accounts is usually due to level of activeness that is assumed side accounts do not have. There are plenty of active sides and plenty of people who do enjoy joining more than one guild. I agree that most guilds tend to have such rules to try and ensure activeness, however, my opinion is that people can be just as inactive on a main as they can be on a side - especially when it comes to guilds. And the question that was brought up on the HC board that made me wonder whether the goal of having a "no side account" rule was really being achieved efficiently was: don't member sweeps and such take care of inactive members anyway? Yes. Member sweeps do take care of inactive members. It is an interesting concept, but I could only see the no-side account rule being utilized for account improvement guilds. I personally haven't seen guilds with rules against side accounts, but I also don't tend to browse other guilds very often. I'd imagine only allowing main accounts is to maintain activeness. I doubt it. I've had members on side accounts actually be more active then those who join on their main accounts at times. If someone was a very chatty and social person, I could see it being done. But you are right that there is a greater chance of conflict of interests. Discussion Topic 5: Application Processes: fair or unfair? Many private guilds require applications for the potential member to complete before they can join. These come in many forms, from chatting on a board, neomailing a form, or making a petpage profile application. Are these applications fair? In what context are they fair/ unfair? Do you think they make a difference to the guild membership? I don't think they are unfair in itself. Especially if the guild is looking for a specific type of member. But I do feel sometimes the requests are too strict. For example, a lot of them require a certain amount of avatars. I don't care about avatars, even though a lot of them are 'easy' to get. That doesn't mean I don't put effort into my account or that I'm unactive. I think you make a good point that in itself they aren't unfair, and that if the guild has a specific type of member they are seeking it makes sense to have an application process. However, when you talk about strict requests (like avatar count) - are those not normally required for account improvement guilds? In which they are looking for a specific type of member - namely ones who enjoy improving their accounts? I've seen them in more than just account improvement guilds. But there it's a fair enough thing to ask for, I guess. Makes sense - if they fit your first posts criteria: if the guild is looking for a specific type of member. Then the requirements are okay. But if guilds that aren't specifically account improvement have requirements that ask for things unrelated to the guild itself, then they are too strict. Another fair point, I'd not really considered that. The pool of potential members is much smaller and most are looking for similar things. We rarely reject an application at my guild. Not from a lack of commitment to ensuring applicants are appropriate to the guild, but from an abundance of good applications. Typically, we give a little feedback and the next submission of the application is accepted. Though, I still think they serve a valid purpose. As a leader who has put many, many hours of my time into maintaining the guild. (Not to mention the time coming up with ideas and concepts and implementing them). I like to know that the potential new members are genuinely interested in joining the guild and are willing to commit some of their own time to becoming a member. Guild leaders work hard to offer different activities and events in return for a members activity - and an application process helps ensure the member is going to be actively committed to the guild. I agree with your points, but the usual neomail applications aren't very strict, in my opinion. Quickly looking through their rules page and sending a quick "app" (which is usually actually just stuff like your nickname and how many hours per day you play) doesn't take more than 5 to 10 minutes. I think the short amount of time used to submit an app is worth the first hassle, which is a public guild having constant new people joining and then leaving soon afterward. It becomes slightly more of a jumble about knowing who is who and who's still here. whereas guilds with a more strict app process tend to gain members who have a much higher chance of staying permanently, or at least much longer-term. I totally agree with your point about guilds with stricter application processes tending to gain members with a much higher change of staying longer. But I'm unsure if you meant that you feel that the neomail applications qualify as strict enough to gain this advantage? For some guilds, their neomail process might be the #1 step, which would require more questions aka more strict, which I think is necessary. But for example, the guild I'm in now has a "quiz" type of thing fixed onto a petpage-- (it's pretty genius) that asks you questions about the rules page. And only AFTER you pass that petpage quiz, it leads you to the correct link and instructions on the neomail application. So the neomail app just ends up being nice and simple... like your nickname, how active you are, and couple other details. (also, about the "at least x # of avatars", most guilds Ive come across still end up just looking through your account in general and making exceptions. The avatar minimum or most other listed qualifications are more of a guideline than a black or white rule) My question is: is there a point to having those requirements then? Or are they just redundant? Most guilds I see DO write "exceptions made" next to their requirements list. And I think most users can judge their own accounts, activeness, explain their situation in the neomail... and assuming the guild is nice and reasonable, will accept the new member. But I think it's still necessary in the way that it will stop a few users who believe that even with "exceptions", wouldnt make the cut... for example, maybe they really aren't as active as the guild would like. Or they really arent as literate as the guild would like, etc. Urr, as far as avatars go though, specifically, I don't think it's necessary at all. XD I believe it would make more sense to write, "state in your neomail app how many avatars you have and how much interest you have in collecting", if the guild feels the NEED to include something about number of avatars. I agree that a too-basic neomail app does little for the end goal here-- having active, engaged members. That way, you maximise your ability to find eligible members, while also standing by whatever principles and requirements you are setting up by having them in the first place. Guilds which make a lot of exceptions are missing the point if you ask me, or have gone wrong somewhere (their requirements are needlessly high or pointlessly low, etc.). I agree with you, and you were able to more eloquently word it than I was. I'm a huge advocate of guilds sticking by their principles/ requirements. I like having policies in place that apply to everyone, and any requirements we have are across the board. I think this makes it very easy to run the guild smoothly. We use our applications at Renegade to determine literacy, mostly. The most common reason we'll reject a member is because their application is sloppy. We want to keep our boards a certain way in the guild, and if you can't put forth the effort in the application, there's little hope you will on the boards. We do ask questions about activity, but it's more to gauge how many new members we should be adding at once then making sure that each member will be on daily. I find them very useful! I honestly only prefer joining private guilds and the MASS MAJORITY of private guilds require sending in some kind of application or fitting some kind of requirement. Honestly, the amount of work a potential new member should have to do during the application process should reflect how much work they will be doing to successfully participate in the guild. I'll use three types of guilds as an example. Covert (don't Worry, I won't give large spoilers) ~ The process to even get a morsel of information is (while not hard) definitely requires the user to think. Once information is given, a petpage portfolio is required as a get to know the member phase before joining. I feel that the amount of work and how it's executed is appropriate to the theme and how the member will be able to utilize the guild in the future. One would have to join to fully understand why though. Neomailed applications ~ I've seen these done well and I've seen these done pointlessly. I actually have seen maybe one guild use the application for the member directory, which was great. I've seen some guilds use them for literacy, which can be usefull, depending on the questions. If the application has several yes/no, one word response types of questions, then it's not so helpful. If it has several random, open ended questions, it can be a good tool. It really just depends. They're honestly not my favorite way to allow entrance because ANYONE fake literacy for one neomail and then get in and post one word posts. But they can work for some guilds, so I don't knock it. Neomail for Invites/Interviews ~ I've seen some guilds that say "neomail me for an invite" or "if you fit the requirements, neomail for invite" but, since I'm so picky, I've never cold neomailed for one. ...I tend to, instead, try to talk to at least 2 or more members from any of these types of guilds before I'll consider joining. As a guildless person, I tend to look for guilds that have members who I can see getting along with and prefer to get to know a few people before joining. So, honestly, I don't have as much experience with blind apps. But they can be useful, I suppose, to blind check accounts stats and (if questions are asked) literacy and personality. and if you can't put forth the effort in the application, there's little hope you will on the boards. ^ That makes sense. Are your applications neomail applications? What sort of questions do you ask? How long is a typical application in terms of getting an idea for the member and their literacy? As for getting information on how active they are - do you store this information somewhere? Or does it just help guide you as your process apps as to how many people to invite? I think that applications themselves are fine, but that the requirements should fit the guild itself. For example, a role-play guild with the application asking for a role-play sample is fine. Something like an avvie-collecting guild, on the other hand, should ask about your interest in collecting and help you get more, but not require you to have a million of them already. ...but not require you to have a million of them already. ^ How are you supposed to gauge interest then? Anyone can say, "Yes, I really love collecting avatars," and only be in it to try to scam some expensive avatar lending items. If you are actually interested in collecting avatars, the vast majority of them have to be collected by your own effort. You can't get lent game avatars. Elite avatar guilds HAVE TO have high requirements because otherwise, an awful lot of scammers would join. As long as the application double up as a yearbook, then I don't mind. I'm a bit lazy when a guild requires a detailed length application. I honestly love applications. I might be a bit bias seeing that my guild requires an application before joining but I've said it before. Our application process is just more information to help you know what we ask for from a member and what we can provide to such members. It's honestly a creative way for me to determine who is SERIOUS about joining the guild. I'm not saying other people that join non-application guilds aren't as serious but I feel that if you're willing to go the extra mile then your chances of actually sticking through with the guild will increase. I also like applications because of the different ways they can be implemented. It can show your creativity and uniqueness of your guild. Fair, taking application forms or requesting the user chat on the guild board or chat with a recruiter. Unfair, only taking applications. No other way to join other than send one. I really like your point of view but would love a little bit more as to why it's unfair. A simple application can take only minutes. Versus a conversation can take days if the two people are on different timezones. Something like an avvie-collecting guild, on the other hand, should ask about your interest in collecting and help you get more, but not require you to have a million of them already. ^ I think you have a point in that the application should match the guild. But doesn't it then make sense that an avatar collecting guild would require that the member has collected avatars? As Anti pointed out, someone who is genuinely enthusiastic about collecting avatars would have already put the time and effort into getting a reasonable collection, no? I'm inclined to agree with your point when it comes to neomail applications - it seems to me that it makes it more worthwhile for the member and the guild overall. Petpage applications tend to mostly be used in a yearbook - but I think they are much more detailed representations of a members potential activity / literacy once they are in the guild. So even if they are not used in a yearbook, they've served a reasonable purpose already. I'm a little confused about your point as well. You said it is fair to take applications, but then later said it is unfair to only take applications. But if you are a private guild and you request applications - does it not defeat the purpose if people don't have to submit an application? Or are you saying there there should /always/ be the option of just chatting on a board in order to receive an invite? Ohh, a roleplayers opinion. I hope you revisit this board. I've been in maybe 2 roleplaying guilds, but I am curious... How detailed do you think an app has to be for a roleplaying guild? You mentioned it's a necessity, but what do you think is /generally/ appropriate and how long should it take a recruit to finish one? well, it really depends for each person, yeah? i've written long applications and short ones, i feel like it's good to find a nice in between. generally, in my opinion, the most important thing is the role play sample. a lot of people rely on quantity for it, but personally i look more at quality; proper grammar, spelling, et cera. i don't think it should take long because then you can risk having the potential applicant lose interest. if the application is never ending, then that is just ridiculous. personally i think it should take only a few minutes, and at the most, less than twenty-five minutes. enough for it to be short enough, but not short enough where simply anybody can fill it out. the most important parts of a role play guild's application, in my opinion, is the sample followed by the activity level bulletpoint that most applications have, then finally followed by a possible "about me" blurb that a few have. prioritizing these three will often lead to a thriving and happy membership, because it shows the applicant (as well as the administrators) that yes, they are concerned with having an active and well-written player, but they are also concerned with knowing you, as a player. which i believe can speak volumes. I just find the whole roleplaying acceptance interesting because of the sample. Yes - I do agree that the sample is a necessity because the guild /revolves/ around people roleplaying, so they need to be able to create a character and a storyline around them that can integrate in with the current plot. It's funny though, because you said "short" application and then "25 minutes". Which yes, I agree is short for roleplaying. However, for a neopian guild, it can be considered long. Just goes to show that the application process really DOES depend on the type of guild and what is required from the member for them to enjoy the guild. I think application processes are fair. For example, when I joined Conjure a month ago, the app process was to create a portfolio. I think longer apps like that give a chance for more permanent members than the simple neomail application processes with 10 questions. I completely agree where you're coming from, but I have noticed some members seem hesitant about portfolio based applications. However, the guilds that tend to require those use them in the guild to participate in everything. Yeah, the portfolio aspect does make people hesitant. I know I was at first but when I realized how simple it ended up being, it wasn't as scary. I think that applications are fair, I often think that requirements such as 150 avatars are more pointless, where its more to have something there, rather than trying to cater for a specific person. I'm in two guilds. Both are account-improvement. But rather different in terms of our we deal with applications. Aethia does have an application, but its really just the information that will go onto your log and we really only ask for you to be interested in account improvement, and then we do have rather high expectations to stay in the guild, in terms of challenges complete. So we really have people join and then see if they are dedicated enough to stay or not. TPF we have high requirements (much higher than I normally see, we require two met out of things like 300+ avatars, 1200+ hsd, 30+ trophies, 350+ stamps) as well as a member poll on the application. But we then have very low requirements for staying in the guild. Its sort of two ways of dealing with trying to find people who will be active and suit the guild. i can't say about non-roleplay guilds with their applications, but it's basically a true need for roleplaying guilds. semi-lit rps probably don't really need them, but anything over that? yes. you don't want people typing one-liners to your five paragraph reply. applications, in roleplay, anyway, help make sure that ic literacy is kept up. that's super important for lit+ / adv roleplays. It's fair. The guild council will be the ones putting in a majority of the work to maintain a guild. They have every right to spell out what type of Neopians best fit their 'vision.' If the guild isn't the right fit, then the person applying just needs to search some more till they find another place. Really, it helps both parties in the long run. TNT improvements: Do you feel that guilds could be incorporated into the site in a more direct way? A lot of people don't seem to be aware of guilds as much as they used to be. At the same time, guilds can foster a sense of community the site could perhaps use, now that user numbers are down. Should TNT ideally pay more attention to guilds to encourage participation in the Neopets community? Helpful or Hindering? I think an interesting discussion would be along the lines of "When Helping turns into Controlling", when referring to members. I've run across this quite a few times in all the guilds I've been apart of, and I'd like to see if others had to deal with this problem, as well, and how they tackle it or prevent it. Member Limits: I'd like to see a discussion on a member limit. I've seen guilds with a limit of ten, others with hundreds in their ranks. I guess the capacity varies between genres and preference alone, but it'd be interesting to get different views on it all. Prizes: I just had a board up for discussion about guild activities and prizes. Neopoint prizes are against the rules for reasons I honestly don't understand. So I'm trying to figure out what everyone else gives out as prizes for games. My guild members are bored so I just came up with games and activities that award guild points, or tickets. But I don't know what I can let them redeem with their tickets. Theft? Stealing content in the guild community. I'll see one of the bigger guilds post about a new activity and then I'll start to similar things pop up in the smaller guilds. When does it go from being inspired by other guilds to poaching? Welcome to the Alliance Guild FAQ! Now that Alliance makes boards on the Help Chat to try and promote guilds and provide answers for those who have never been part of the guild scene before - we decided to display Frequently Asked Questions on this page. This way, other people can browse through the questions and answers. If you notice a question whose answer you think can be improved upon - just send Bethany a neomail with the information you think should be added to the answer. Feel free to send new questions to me in this way, too. A guild is basically a club where members with similar interests can gather to chat. They often become very tight-knit and are a fantastic way to make firm friendships on neo. They are created by Neopians like you and me, and then they gather members by advertising on the GC. Often leaders put a lot of time and effort into creating pages for the guild that might have information, rules, activities and more. You can visit the Guild HQ here. Once created, a guild will contain a message board, calendar, and member list. At the discretion of those with admin powers, they can also create polls for members to vote on, and also allow for invite privileges (this means a member can or cannot send out guild invites to allow other Neopians to join). Additional to these basic features that come with all guilds, the guild leader might chose host a guild webbie and a portal. A guild webbie is a page created on a petpage that is typically hosted by the leader. The webbie will contain information that explains the point of the guild, as well as the rules and ranking information. For private guilds, they often have a none-member webbie as well as a more in-depth one for members. Typically extra pages are not included within the webbie, but are instead linked to through a portal. What is a guild portal? A guild portal is a page that basically just contains links to all the pages that belong to the guild in question. It's basically like a site map just for the guild. These pages often make it easier to get around the guild, especially when they have a lot of different pages. Can my guild have activities? Yes, your guild can organize activities for its members to take part in and enjoy. Some fun activity idea can be found here. What is not allowed is offering Neopoint prizes of any kind. This includes prizes for completing activities, donating, or random giveaways. Can you be in a guild on all of your accounts, or just your main? You can be a member in a guild on all of your neopets accounts. So, you can be in a total of five guilds. When making a guild, can you change the name/description/message later on? Yes, everything can be changed after the guild has been made. There are so many guilds to choose from! How do I know which guild is right for me? One of the best ways to find the right guild is to decide on your main interests. Ones that you'd like to also enjoy while on neopets. If you like to focus just on neopets while on the site, then joining a neo-related guild would work well for you. But, if you have strong interests in movies/books/anime/writing or any other none-neo-specific interest, then you might consider seeking a guild that fits with one of these. Remember, there is also the option of "themeless" or "multi" guilds that stray from having one set theme - while a lot of neo-related guilds often make efforts to include other interests, too. Other factors involved in choosing a guild can include deciding on: literacy level, public or private, member amount, age of guild, and other factors that don't directly relate to the theme. How do you join a public guild? You can either be directly linked to the guild, or you can click on the guild name on a members userlookup. Once you are on the guilds front page, there is an option in the link table that will say "join guild". Once you are a member, this option change to "leave guild". How do you join a private guild? Private guilds cannot be accessed just by visiting the guilds link. It will come up with an error message that says Sorry. You are not a member of this guild!. The only way to join a private guild is to be invited by one of the members of the guild (who has the admin ability to send out invites). These are automatic neomails sent when a username is typed into the invite box. Once you receive this mail, you'll be able to view the guild front and click the "join guild" link. Often, private guilds require interested parties to fill in applications to let the leaders know a little about them. So, be sure to ask one of the guild members just what is required of you. A lot of guilds seem to have "no side accounts" as a rule, why is this? Some guilds do require that members join on their main account, and this typically is done because Guild leaders can sometimes have trouble ensuring that all their members are active. To try and help keep activity levels up, they might only accept main accounts into their guild as the hope is that these accounts are more active and less likely to be left unlogged into for days. It can also apply for goal based guilds which focus on account improvement, or for private guilds which have requirements for joining (such as avatar count or trophies). This question ended up raising some interesting discussions, and we hosted a GC discussion based on this. To see the discussion, click here. Welcome to the Alliance Guild Editorial. This page just lists all the questions related to guilds that have been published in the Neopian Times. To make searching for specific editorials easier, the title of each question includes a key word. Just ctrl + F to search the page for the specific key words below (including the *'s). *Rules* - These questions address what rules guilds can make. *Theft* - These questions address issues of theft. *Prizes* - These questions address the issue of prizes being against the rules. *Layouts* - These questions address what is allowed on guild layouts. *Misc* - These questions don't fit into a specific category. I'm seeing a lot of guilds that use guild "points" as a currency where members can buy actual Neopoint items. These points are awarded when members participate in activities, recruit members, and donate. Can you please clarify whether this is against the rules? It seems to me like it is exactly the same as offering prizes for contests, but just adding a middle step of earning "points" to then "buy" the prize. Thanks. This is basically just a way to get around the no prize rule, which becomes an issue for us when time and effort is donated and rewards are promised (but sometimes not awarded), which causes big ol' messes and drama. We are planning on a way to help make it so guilds and nice people can give stuff away, but that's still in the works. For now, the rules still apply. If that changes, we'll be sure to let you know. Hi, TNT! I recently joined my first guild. A week later, I had to leave my computer for about half an hour and, when I came back, I had a bunch of Neomails from the guild owner. The most recent one said that he was kicking me out of the guild because I was too "unresponsive." Is this allowed in guilds, kicking people out because they don't respond to mail? Hey, TNT! *hands Candy Pumpkin Latte* I was recently asked a question that I do not know how to answer. I am curious whether you can clarify issues with regard to side guild accounts. SO, let's say Bob joins a guild on his side, which I understand it is okay to do. However, what happens when the guild does fun stuff like tossing goodies at each other? Is that a freezable offense on a side - receiving items even though you throw some back? I mean, you are NOT selling them or making a profit. No one wants to get in trouble or get iced. :( Please help to clarify this issue so Bob can avoid getting in trouble! Thanks so much, and please REMOVE my name if you decide to publish! Have an excellent Neo day! Getting legitimate items and gifts from friends and guildmates on your side accounts is perfectly fine. What we don't want you to do is visit dailies and earn Neopoints or items that would normally not be brought into the economy. However, if you do get items from friends and wish to sell them, we recommend doing so on your main account. Hello! I'm in a very tightly-knit guild, but we're experiencing a dilemma... our guild leader has poofed, vanished, disappeared. And with her? The guild admin. Is there some way we can get others to receive administrative powers in the guild? Please remove my username. Thanks! If a guild leader is frozen, after two weeks they are removed as guild leader. If they are simply taking a long leave of absence, however, then it's unlikely we can assist. Hi there, TNT. It's been a rather rough day, as my guild leader recently discovered that a former member (who left our guild ages ago) has now created her own guild. Her guild's theme oddly resembles ours and some of her pages even have text taken directly from pages of ours. Her graphics are similar to ours and she even used the same rank titles. I was wondering if any of this is against the rules, because it has really devastated our council and other guild members. Stealing the creative work of someone else is not allowed. Please report the situation to our Support Department with as much evidence as you have so that they can investigate the situation and determine if any action will be taken. Hi, TNT. I just wanted to ask you something. I was on the guild boards and saw somebody had a guild that was only available to users who are 21 or older, and it had been made private. I'm guessing they don't talk about inappropriate stuff or religion or politics, because it would have been deleted by now, but is this allowed? Private guilds are welcome to limit their invitations to whomever they choose. There are actually quite a few adult guilds in Neopia, but they are held to the same chat rules as any other users. As long as the guilds aren't religion / politics / race-themed or something along those lines, we don't have an issue with membership restrictions (provided they follow site rules). Hey, TNT! (: I was looking around for a guild and one had a webbie that stated the requirements for the guild. It said that you have to donate 20,000 Neopoints to the guild to get in. Is that against the rules? I'm confused, because aren't guilds just for chatting, making friends, and having fun? Also, should I report it? Please clear this up for me. Guilds, especially ones that are private communities, can set their own rules (as long as they follow Neopets' Terms and Conditions). However, they are also responsible for upholding them. Say, for example, that there's an avatar guild that only accepts members who have at least 250 avatars. That's the prerogative of the guild leader, and just fine by us. If you're not allowed to say "Peophin" on the guild boards, then that's also up to the guild rules. That being said, Neopets will not punish someone who doesn't abide by guild-only rules. Also, as with any situation, there are some extremes that are not allowed, such as guilds that bring real-life issues like religion or politics into play. No political party-only guilds would be allowed, for example. Hi, I have a question. Many guilds have full-page layouts that hide the default guild sidebar and navigation. They do, however, re-type all of the "needed" navigation, such as the "join" link, the link to the message board, and so on. I was almost completely certain that this was against the rules, but I don't want to be wrong on this one and I think publishing a question in the Editorial would have more of an impact. So... are full-page guild layouts against the rules? If so, some people would like to know why, so if that is indeed the case, then why? Much like User Lookups, all of the information and links need to be available. Full page layouts in guilds are fine as long as ALL of the links are present plus easy to see and access, especially those that allow you to leave the guild. If people are unsure of how to leave a guild or navigate away then it's breaking the rules. We don't want to hamper your creativity, but form needs to follow function. Alliance's resource directory seeks to provide a wide range of guild-related sites, guides and articles. The resource directory is maintained by several faithful volunteers who regularly check the links and information for accuracy. If you have any questions about the directory, please contact us! 1. Articles We list any guild related articles submitted to us. We accept both already published NT articles, and new guides written for our page. 2. Sites We also list sites that include resources, tutorials, and premades that would be helpful for guild leaders, council or members. The process to submit your site or article is very simple; we have no requirements except that we need the site creator/ article author to submit the form. Fill out the appropriate following form and send it to Beth! Feel free to write a new article and place it on a petpage for Alliance to publish in the links to the left. For those submitting already published NT articles, we do ask that you specify whether you would prefer to not be re-published in our featured section. We want a whole range of sites to be featured in our directory. Some site types we are looking for include: any premades, coding/graphic tutorials, requests, resources. If you are not sure if your site is appropriate for Alliance, just ask Beth! Guilds are a huge part of many Neopets users' experience. They can be a great way to find users with similar interests and to make awesome friendships. However, finding a good guild can often be a challenge. There are many things to take into consideration when looking for a guild. Also, there are many things you can do as a member to ensure that you have a good experience in your guild. I have been a guild council member or leader of my guild for over four years, and before that I had been member of many guilds. I have seen both good and bad guild members and have put together some helpful tips to be a good guild member, as well as how to find a guild that is right for you. First, you're going to want to think about what kind of guild you'd like to join! There are hundreds of guilds on Neopets, and lots of them are currently active. It can be hard finding the right one for you when there are so many! To narrow it down, think of some things you are interested in. There are guilds for any theme you can think of provided it's appropriate for Neopets. There is probably a guild out there for any of your favorite hobbies or activities. There are guilds for avatar collectors, for gamers, for Kadoatie feeders, etc. There are also guilds out there with no theme at all; they are just centered on chatting and having fun. Once you have decided what subject you want your guild to be about, your search will become a bit easier. A very basic but important question you need to think about. How much time can you devote to a guild? If you're only on Neopets a couple times a month, you shouldn't join a guild that requires you to be super active. A more laidback chat-based guild might be better for you. However, if you're on Neopets a lot, you'll want to find a guild that has members who are also very active. Are you looking for a guild that is super active with tons of activities and services like avatar items, pet lending or an adoption agency, and tons of message board posts? Or are you looking for a more laidback guild that you won't need to check on every day, perhaps one that is more chat-based if you don't want to participate in a lot of activities? Would you feel more comfortable in a smaller, tight-knit guild, or a bigger guild with tons of people to get to know? Is it important for the guild to have a nice layout? Maybe you'd like a guild where you know the leader is active and on the message board often. Whatever your preferences are, there is a guild for you out there! The best place to start your search for a guild is by hitting the Neoboards. If you're seeking a guild with a specific topic, such as avatar collecting, you might want to check the Neoboard with that same topic. (Avatar guilds are typically advertised on the avatar chat, you might be able to find a guild about Kadoatie feeding or gaming on the games board, etc.) Otherwise, most guilds are advertised on the guild Neoboard. I recommend browsing that board. Look at what guilds are out there, and make note of ones you like. Try checking the board at different times of the day so you really get a sense for what is out there. You can also make your own board stating your specifications for the guild and let people post about their guilds. This way you can see a lot of guilds in one spot. Again, go through them all and pick out the ones you like best. I suggest both methods to maximize the amount of guilds you're exposed to. In both cases, try to make an effort to talk with the person trying to recruit you. If you're posting on an advertising board then try to chat with the current members on that board. This will give you a feel for what the guild's members would be like if you joined the guild. As you are making your list of possible guilds, make note of things you especially like in the guild such as: a lot of nice members, a beautiful layout, lots of fun activities. This will help you compare the guilds more easily when you are narrowing down your choices. It seems like a bit of work, but taking a longer amount of time to consider your options is more likely to result in your finding the perfect guild for you. If you just decide to join a guild on a whim you may find that it isn't really what you're looking for, which results in guild hopping. Taking the time to compare many guilds and to talk with current council and/or members of the guild will ensure you're joining a guild you actually really enjoy. Once you're satisfied with the list you have been keeping, it's time to start comparing and removing guilds that, while you like, may not be the one for you. Do this until you find the one guild that meets all of your specifications! Once you feel you've found a guild that will be a good fit for you, actually joining is easy! All you have to do is click the join guild button-blocked-ing a new guild can be pretty intimidating; you are breaking into a group of users who already know each other. This is especially so if the guild you are joining is larger or is well-established. Newer, smaller guilds typically have fewer members to get to know with less history than larger, older guilds. The first thing you should do when you've joined a new guild is to familiarize yourself with the rules of the guild. You wouldn't want to accidentally break a rule without knowing it; that wouldn't be a very good first impression. Another thing to do is to browse any activities or services (such as avatar lending, special guild actions, adoption agency, etc.) the guild has going on. You don't need to participate in them all right away, but knowing what the guild offers will be helpful in your interactions with council and other guild members. It will show that you have taken a real interest in being an active member of the guild. Once you have done that, it's time to post on the guild's message board! A simple post introducing yourself and stating that you're new to the guild is a good start. Current members of the guild will probably welcome you. However, sometimes they may not. They could be caught up in their on-going conversation, or may have just not seen your post. Don't take it personally if they seem to be ignoring you; just try to jump into their conversation. If they still appear to be purposely not including you, then perhaps it's best to just find a more welcoming guild. Breaking into a new guild with a group of people who already know each other can be hard. Everyone already knows each other and is used to each other, so you might feel like an outsider. The easiest way to fit in is to just jump into conversations. I can't tell you how many times I've heard a guild member complain they are being ignored, when in reality they just weren't trying to get in on the discussion. It shouldn't be expected that every time you come onto the guild boards and say nothing but hello, that people will immediately stop what they are talking about to greet and welcome you. When you come online and say hello, ask how people are doing today, or read a couple posts back and add something in response to those to your own post. You could also just bring up your own topic for discussion and people will probably join in. Remember to just be yourself, as cliché as it sounds. Don't feel you need to "buy" your friends by giving your guild's council or your guildmates gifts to make them like you. All you need to do is to treat people with kindness and be you! Your guildmates will recognize how genuine you are, and you'll have no problems at all making friends! Once you have established yourself in the guild and have made friends, staying active is important. Many guilds require their members to remain active, and threaten the removal of inactive members. If you are in a guild like this, try to stop in on your guild boards whenever you get a free moment on Neopets so that they know you are around even if you can't stay and chat for very long. Even if there is no such requirement, being an active member will still be good for your guild. Guilds often close just because the members stop being active. Also, if a guild has activities, participate in them when you can! You can't get prizes from them (as it's against Neopets terms and conditions) but they can still be tons of fun! It will make whoever put the activity together really happy to see you take the time to take part, and the interaction between members that activities can involve will help make the guild more active and will help you make friends! Guilds have a ranking system built into them. There are the five council members that you can clearly see on the guild's sidebar. In addition, there are five regular ranks that guild members can achieve. Typically the guild's leader or council decide what guild members must do to achieve these ranks. Posting a certain number of times and being in the guild for a certain amount of time are the most common. Whatever the requirements for reaching the next rank, doing so usually comes with more prestige. Also, frequently guilds will have things like avatar lending where you can borrow more expensive avatar items or rarer avatar pets the higher your rank in the guild is. For the most part, just being active will have your rank increasing over time, so remember to participate in your guild as much as possible. Ranking up helps you and also helps the guild maintain a good activeness level if people are continually trying to raise their rank. Remember not to spam your guild's message board or break any of your guild's rules in the process of trying to get your rank raised, though! Respect is an important part of any guild. If the council and members don't respect each other, then the guild will surely fall apart. You can't control what other people do, but remember to be respectful at all times. You may not get along with every single member of the guild, but try to remain civil with them for the good of the guild. Remember that each user has feelings, so be tactful with your words. Council members put in a lot of time to making the guild successful, so be respectful and appreciative of their efforts. Also remember that they too have feelings and have interests on Neopets outside of guild upkeep, and may make mistakes from time to time. In addition, without members there wouldn't be much of a guild. Mutual respect is important for the guild to succeed. Sadly, sometimes problems will erupt. Sometimes arguments break out because of a misunderstanding, sometimes simply because a user chooses to make drama. Whatever the reason, the way you handle yourself can determine your level of happiness with your guild, as well as the overall success of the guild you are in. If there is a fight happening on the boards, don't egg your guildmates on by saying something like "Oh, a fight, let me grab some popcorn." That is just giving the issue unnecessary attention. The better course of action is to ignore it if it doesn't involve you. While it may be tempting to jump in on the side of a friend in an argument, that will just exacerbate the situation. Let your friend fight their own battles; jumping in is just going to make the other side more defensive or make someone else jump into the fight on the other person's side. The situation will likely get worse and worse until the whole guild is in an uproar over something that probably started out as something small. Again, do not make the problem worse by egging people on or taking sides. Just ignore the people arguing and allow a council member to take care of it. If it's you who is experiencing a problem with another user, consider taking your argument to Neomail. A simple Neomail saying, "Hey, what you said there hurt me, could you please not do that anymore?" will probably solve the issue. On the other hand, calling them out on the guild board will just make the person feel cornered and embarrassed. The situation is then more likely to spiral into a yelling match as opposed to a polite conversation. If a person calls you out for something on the guild boards, while it may be tempting to react with anger, tell them that there are better ways of handling the situation and that you won't argue with them on the guild boards. There is no need for you or other members to make spectacles of themselves on the board. The main points of a guild are to have fun and make friends. If your guild isn't doing this for you anymore, then maybe it's time to move on. If the guild is causing you more stress or upset than not then it's definitely time to find a new guild, or create your own. Guilds are a huge part of many users' experience on Neopets. They can provide a tight-knit community of users who share a similar interest where lots of long-lasting friendships are born. It can be hard to find the perfect guild for you, so an alternative to joining a guild is creating your own. I have created several guilds in my time on Neopets, and I have been the leader or council member of my current guild for four and a half years. This article is a compilation of tips I have found useful for starting up and leading a highly successful guild over the years. This is the most obvious starting point: what kind of guild do you want? You can make a guild focused on pretty much anything provided it's not going against any of the Neopets terms and conditions. Are you a gamer? Perhaps then you should create a guild for gamers to come together and discuss tips and tricks to their favorite games, or just brag about their latest trophy accomplishments. Are you an artist? Then maybe making an art themed guild would help you meet fellow artists on Neopets. Do you love to collect avatars? You could make a guild centered around that as well! My experience has mostly been with avatar guilds, and many of my examples will reflect that. You can, however, adapt this guide to work for any kind of guild. Working as a group will allow you to delegate the responsibilities of the guild, therefore taking some of the work load off of yourself. It also gives you and your friends a fun thing to do together, and it's easier for some people to go into things with friends to back them up. If you start with a group you're starting with three or more members instead of just one or two. However, working with other people can prove to be quite difficult. The guilds ranks are set up in a hierarchy and to many the higher their position means more power. Arguments could erupt between co-owners about which council spot they get, or about any of the many decisions you'd need to make before even starting a guild, never mind once the guild opens. You won't always agree with everyone, so you have less freedom in choosing what you want for your guild. If one person is away for a time, you would have to wait until they returned to consult them if you have to consult all owners before any guild action is put into place. Also, from what I have seen, more drama happens in guilds with a group of co-owners. If one of the owners gets upset and leaves, chances are another one will as well, and then the guild ends up being split up because of it. Now that you have a theme, and possibly some co-owners, it's time to decide some things. What things are important for you to have in your guild? Do you want a lot of fun activities for members to participate in? (Just remember, no prizes; it's against the rules!) Or would you prefer to be solely chat-based? Will you have a fancy layout? Will you have special services such as lending avatar items or pets? Perhaps your guild can offer premade graphics or fonts for its members. If you do have activities, it's best to have a variety unless you have a very specific guild theme. If not everyone in your guild is an artist, don't make all of your guild activities based on making some kind of drawing. If not everyone is a gamer, having your only activity being a game tournament may not be a smart move. Your guild will surely grow and change once you start getting members, but it's important to have some things ready for your members to do when they join. Another important question to answer is whether you'd like a private guild or a public guild. Public guilds are nice because you can meet a greater number of different people. However, with a private guild you can screen who joins by setting up requirements, which will help keep out members who might try to beg or scam from the guild. If you do want to have a private guild, you will need to discuss what requirements you want to set for people to join. Pretty self-explanatory, but a very important step indeed! Now that you have worked out what your guild is all about and what kinds of fun stuff it will include, it's time to pick your guild's name. Make sure you pick a name that you'll still like years down the line should your guild be successful enough to last that long. A guild's name typically has to do with the theme of the guild, or is just generally cute or witty. However, while important, having a cool name isn't what's going to make a guild successful in the long run; that will depend on the management. If you are going solo on your guild-creating adventure, this section won't apply to you just yet. Once people begin joining, though, and your guild grows, you will probably want to choose some council members to help you out. When choosing council members, it's best not to just choose your friends or the people you like the best. You're going to want to choose people you know you can count on to be responsible for what they say they will do. If you are making your guild with a group of other people, once you decide what things you want your guild to include, it's up to you all to decide who will do what. If someone is great at graphics, then they should be in charge of making a layout for the guild's homepage as well as for any petpages you might need. If someone loves organizing, they should be in charge of organizing events. Someone also needs to come up with the names of guild ranks, and how they ought to be achieved. Any activities or services you want to have set up should also be set up prior to your guild's opening and put on a petpage. You may feel like you need to take on all the responsibilities yourself in order to get things done right. While this will be fine at first, you will end up stressing yourself out a lot. If you have people assigned to council or people who are supposed to be co-leaders, then don't be afraid to ask them for help and give them assignments you feel they are capable of. If other members are willing to help you out, then let them. It will give them a sense of accomplishment to be able to help out, and it will give you less to do. When you make an advertising board, make sure your title is eye-catching. It is the first thing of your guild the public will see, so you want to draw them in. Saying your guild's name, and possibly some of its good features in the title along with some smileys, is a good way to go. Inside, you should introduce yourself – this way people can see that the leader (or whoever is advertising) is friendly and relatable. You should also introduce your guild. Say that it's brand new and is now welcoming new members. List all of the fun activities your guild has to offer, as well as any other services such as avatar lending. You should also make note of what petpage your guild's website is on, and what requirements the guild has if any. From there, you and any co-owners ought to just chat on the board and be helpful and friendly to anyone who comes seeking an invite or having questions. Often people make boards about being guildless when they are seeking a guild. If you see someone looking for a guild, first check to see if they meet your guild's requirements if you have any; you wouldn't want to tell them all about your guild just to find out you can't really invite them because they don't meet them. Also make sure that the guild you own is one they're interested in joining. If they do meet the requirements and are looking for your type of guild, either post on their board or neomail them (don't neomail them if they ask you not to) and introduce yourself. Tell them you saw that they were looking for a guild and that you think they'd be a good fit for yours. Then give them the info you would typically give in an advertizement board, tell them you're willing to answer any questions they may have and are ready to send an invite at their request. Also, wish them luck in finding a guild. It's important to stop by your guild's message board while new members are joining. Welcome all new members to your guild, and try to make sure that newer members are being included in discussions. If a guild member feels like they are welcomed and liked, then they will feel they belong in the guild and will therefore stay in the guild. If a member joins and feels ignored, they are of course far more likely to just leave the guild to find one they fit in better with. Not everyone in the guild will always get along, that's a given. You yourself may even not like people in your guild. However, it is important to remain impartial with your members. If you show favoritism for a few members, people will pick up on that and leave. All of the same rules should apply to everyone; your friends shouldn't get special treatment. If not everyone is equal, the guild is sure to split up. Still, arguments and drama are bound to happen. The way you handle these things is important because a leader that can stay level headed and impartial during drama is one that will lead a successful guild. If someone is misbehaving, neomail them and ask them to stop and explain why what they are doing is against your guilds (or Neopets) rules. If you call them out on your guilds boards, they will feel embarrassed and attacked and will probably get defensive and make things worse. Do not give the person the satisfaction of upsetting the guild's balance by starting a full-out argument with them. If they won't follow the rules even after being given a warning, then suspend or delete them from the guild (and report them if necessary). Now you've gotten past the set up period, and the member count is growing. People are chatting it up on the guild boards and are having fun with all of your guild activities. However, owning a guild isn't always smooth sailing. Some points of the year are more active than others; don't fret if things start to slow down. People just get busy is all so you don't need to suddenly close the guild down because people aren't posting a message a minute! Make sure there is variety in your activities; always keep changing things up and adding new and exciting events and activities to keep your guild interesting. Try to think up topics for the day that guild members can discuss, so there is something to keep conversation flowing on the guild boards. Also, be sure to ask your guild members what they'd like to see in the guild - if they get to help pick what they do, the odds are higher that they will actually participate! Make use of the guild mailer feature - it's the best way to send out new info to members and to get their feedback. Most importantly, have fun! Owning a guild can be a little bit stressful sometimes. Dealing with people in an impartial way can be tough. However, owning a guild can also be very rewarding with the friendships you make and stuff you learn from your guildmates. If you stop enjoying what you're doing, it's time to stop doing it! If you feel burnt out, take a break, maybe even give up guild leadership to a council member you trust. You can return as leader later if you want, or you could just enjoy being a member. At any rate, happy guilding! Perhaps you are in a new guild that is just starting out, or the leader of a successful guild with several hundred members. Either way, you are probably still looking to welcome new members to your guild family. Below, I have outlined the three most common ways you can advertise your guild in a polite, yet effective way. Before beginning to advertise, however, take a step back and check your guild. Most Neopians look for a guild that is fairly established. This is mainly for newer guilds only, but do make sure your guild has the basic foundations down first before you get your guild's name around town. Check if your guild has an eye-catching layout and a webbie – usually on a petpage – that lists all the necessary information people will want to know about your guild. These include topics such as a brief intro about what your guild has to offer, rules, and requirements. Got it? Alright, moving on. Strategy 1: Advertise to someone's thread. The most common way people advertise their guilds are to go directly to people who have created guildless threads on the Guild Board. Don't go posting on the first guildless board you find, however, unless it's right for YOUR guild. Check what your guild's requirements are and advertise only to those who fit your requirements and are interested in your guild theme. This will save your time and the guildless person's time. If your guild is a roleplaying guild and the guildless user wants a Neopets-related guild, then just wait for a new thread popping up looking for a roleplaying guild. After all, you wouldn't want someone who dislikes roleplaying in your roleplay guild, right? Once you've found the right person, read their requirements. If you want to recruit someone, take the time to respect what they've written and follow their guidelines. Once you have decided that your guild fits their requirements, go ahead and post your ad on the thread. Most do not want you to post a premade ad for your guild – they're going to be joining your guild, so take some time to show that you care! A paragraph about your guild, with links included, usually suffices. Be sure to introduce yourself and take a moment to address the fellow guildless user by name. After you've posted your ad, stay and chat. The guildless person may want to ask some questions, and you will need to be there to answer them. If they do not have any questions, you can always ask how they are doing and perhaps make a new friend in the process, even if they choose someone else's guild. If their board is swamped with ads and they are busy, wish them luck and leave them to peruse the guilds at their own pace. DO NOT constantly beg or whine them about whether they have decided to join your guild or not. This can repel many potential members that may have been interested in your guild. I have found that advertising in a group can be very effective using this strategy. If you have several members online at the same time, you can advertise together and help each other reinforce your guild's positive qualities! You will also be much less lonely advertising with your friends. Strategy 2: Creating your own thread. Another common way people advertise is to create their own thread. Begin by creating a title that will attract people's attentions. Several guilds use tasteful smileys or symbols to stand out from other titles. Be careful, though – overloading on these smileys or symbols can cause blindness and can be a huge turn off. In your title, you should also aim to include your guild's name and some words about what kind of guild it is. That way, guildless users can save their time by glancing over your title and deciding whether your guild fits their requirements. In your first post, introduce yourself and your guild. Clearly state the theme of your guild, and be sure to link to your webbie. Provide all the information necessary about your guild to save others from having to ask for basic guild information. Remember to be friendly and courteous – this board is a representation of what your guild is like. If your first post is sloppy and illiterate, people may believe that your guild may also believe your guild is sloppy and illiterate, even though it may be the best guild in Neopia. You will need to bump your board fairly often to stay on the first page of the Guild Boards. If not, your board will slip off into the second, third, or even seventh page, where people rarely peruse. You can bump by posting random facts about your guild, your favorite song lyrics, or by posting a single "bump." This will ensure your board will be noticed on the guild boards. Sometimes, a user will post a comment on your thread, whether it be a question, comment, or a simple "good luck!" Take the time to greet everyone who posts on your thread, no matter if they are interested in your guild or not. Bumping your own thread is also more effective in a group. Members can take turns bumping, or even have a conversation on the thread. This will help bumping be less lonely and mundane, and ultimately turn it into an enjoyable task. Strategy 3: Posting a graphic on your lookup, shop, etc. Tired of typing so much? Place a graphic on your lookup, shop, or anywhere where a user enjoying the site will be able to see it. For example, if you own a gallery, you can place a small blinkie in the description box of your gallery. Most guilds offer a page where you can find a variety of graphics that you can advertise your guild with. These may include user lookups, banners, icons, or blinkies. If a page like this is not available, you can make your own! The banner should be eye-catching – however, stay away from neon colors and flashing text as those can be obnoxious. Remember, your banner is a representation of your guild, so keep it pleasing to the eye and readable. Link the banner to your guild's website, or wherever a user will be able to find more information about your guild. These are three effective ways to advertise that will guarantee you members! Some people find that they prefer to advertise using only one of the strategies listed above, but you can combine any of them to your liking. The most important thing is to be an honest representation of your guild. Treat everyone with kindness and respect, despite their choice of guild – you'll still make a friend in the process! The most important thing to remember, however, is that advertising isn't the only thing that makes a successful guild. Quality over quantity is the most important thing. Your member count should not just be a number that you are looking to increase. Get to know the members you have recruited and treat them as actual people instead of advertising just for the sake of a high member count. Hopefully these tips and strategies have helped you gain some new members to join your guild community! Feel free to neomail me with any questions, new strategies, or comments you may have. If you're on a guild council or in charge of guild activities, often it's difficult to think of new and exciting activities for your guild members to participate in. So here are some ideas. Ask your guild members to send you a neomail with some questions about themselves. Put the answers on a petpage without the usernames and see if your guildees can guess who is who. It's also a good way to get users to communicate with each other! So ask those questions and get some answers and presto! Activity! If you want your guildees to work on their accounts, then collecting stamps is a good way of helping them build on their accounts. Post a page of stamps and see which ones they can collect. If you're part of an avatar guild, then it's useful to have a Game Saturday or Game week where everyone in the guild works on a particular avatar game such as Petpetsitter or Volcano Run. Get your guildees to send their scores to you and then find out who can score the highest. Find some games you're good at and put high/low scores and see if your guildees can beat them. This activity is inspired by the one that the Neopets team runs so if you're stuck try looking up past Daily Dare challenges and see if anyone can do them even if the scores seem impossible! Getting into the Neopian Times is often the dream of many Neopians, so why not have a writing activity where your guildees have to write a story or article for the Neopian Times? You can give them writing exercises beforehand or even run a writing workshop. This way your guildees build on their writing talents before they've even tried to get published. If you yourself have been published, then why not give out tips? For those creative guildees out there, drawing activities are right up their alley. You can pick a theme for them to draw on or give them a task. If someone in your guild has ideas for comics, why not get others to try and draw them in the hope of entering the Neopian Times? And if not, then you can always persuade them to attempt an entry for the Beauty Contest! Based on AAA and Abigail yet again, a game challenge involves a series of 'challenges' where your guildees have to get a particular score in a game or play games that they normally wouldn't play. Playing Key Quest with guildees can be a lot of fun. So why not make it an activity? Just make sure that everyone plays fair and get them to post what exciting prizes they get on the guild board! This way they're playing Key Quest and keeping the guild board active. Scavenger Hunts are fun, especially on the Neopets site. Give your guildees a list of pets or items to find on the Neopets site. They can be food or items for a season or even a pet. Just make sure they only send you the name of the item instead of sending you the items. This is one of my own ideas for an activity. There are lots of pets in the pound with terrible names, so why not make adopting them out a guild project? For a month, each guildee adopts a pet with a bad name from the pound and zaps them until they change to a more desirable species then rehomes them. It gives you something to do collectively as a guild and it also helps out those pets in need. Never fed a Kad before? Why not head over to the Kadoatery with your guildees and see if you can feed a Kadoatie? Feeding by yourself can get boring, but feeding with friends or guildees is fun. Make it fun by posting your feeds on the guild board! Playing games on the guild board can get a bit complicated, but there are quite a few games you can play on the board such as Avatar Simon and Avatar Survivor. Avatar Simon: The host puts 10 avatars as their active and everybody puts whether they have it or not. Avatar Survivor: The host picks a theme such as 'dark' or 'happy' and everyone changes their avatar to one they think suits the theme then votes on who they think has the worst avatar. The person still standing at the end wins the game. The first day of the month is trophy reset day, which means there are higher chances of getting a trophy for a flash game! So if your guild focuses on building up an account, then why not post some easy game trophies for your guild to work on? Or else get them to choose a game and play it for a month so that next month they can achieve a score that will definitely get them a trophy. Some easy game trophies include Grand Theft Ummagine and Ruins Rampage. Finding things is a fun game. You find certain things like eyes or hats on Neopian characters and cut these out in a paint program so that your guildees have to find the object or Neopian it belongs to. Earning neopoints is a big part of the Neopets world so why not get your guildees to deposit their neopoints into the bank. Then have someone choose a game and see how much everyone in the guild can earn! I saved this for last. Special events are always happening around the Neopet site such as the Altador Cup. Why not have special activities for when they come around? You could have your guildees write a commentary, make a uniform for a new Neopian team or play Yooyuball. The world is endless. There are of course many more activities you can do in a guild. These are just some suggestions. So go and explore, make your own activities and see what works for your guild. And even if it doesn't quite work out, at least you'll know for next time!